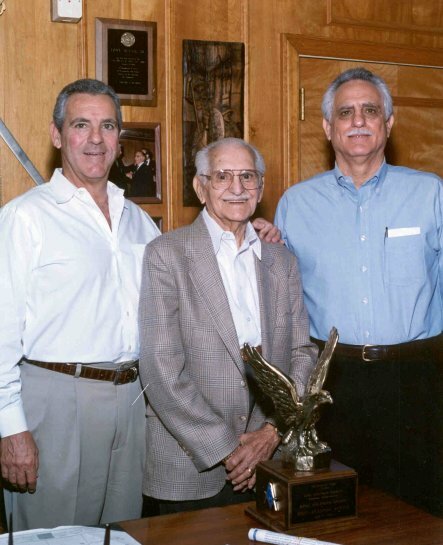 Alfred Alessi, Tony Alessi and Tony Alessi Jr.
At 15, Tony began working in the cigar factory in Tampa for four years until he was hired as a salesman for Swift and Company. Swift and Company treated Tony very well and he loved his job. But before long, Tony met his wife, Rosalia Cacciatore, and they wed and welcomed their first child, Tony Jr. Seven years later, their second child, Alfred, was born. Once his sons were born, Tony realized there was only one problem with his job at Swift and Company. Though they supplied him with his first car, a company car, a job he loved and the techniques of business management, they had a policy that family members of employees could not work for the company. Tony was a family man and put his sons first. Together with his wife, Tony decided to start his own company. They saved up and started Central Provisions, which after several name changes later became Vigo Importing Company. Vigo Importing Co. was formed in 1947 and the Alessi brand came later. Today, three generations of the Alessi family work at Vigo Importing Company, including Tony Jr. and Alfred.